Courtesy of The Independent Voice of Blythewood and Fairfield County; written by Barbara Ball. WINNSBORO - Fairfield Central High School teacher Chanda Jefferson was surprised at her school today when State Superintendent of Education Molly Spearman arrived unexpectedly in Jefferson’s room to announce that she has been selected as one of five finalists for the South Carolina Teacher of the Year award. Jefferson was then presented with a bouquet of flowers, another bouquet of balloons and a check for $10,000. A ninth through twelfth-grade Biology teacher at Fairfield Central, Chanda has worked on both the local and state levels to increase student performance of the South Carolina Biology I End-of-Course exam. In 2014, she received the Outstanding Biology Teacher for South Carolina Award presented by the National Association of Biology Teachers. She was one of twenty teachers to receive the Princeton University Fellowship for Teachers and one of three teachers to receive the Amazon Educator Academy Scholarship. Harvard University invited Jefferson to be a guest speaker for the 74th Annual Society of Developmental Biology Conference. Outside of the classroom, Jefferson has served as an Education Network Partner for the National Human Genome Research Institute, helping to plan a National DNA Day Celebration in South Carolina. Spearman praised Jefferson for catering to each student’s individual learning style and using hands on activities; incorporating social media, scientific modeling, inquiry, and STEM techniques in her lessons. 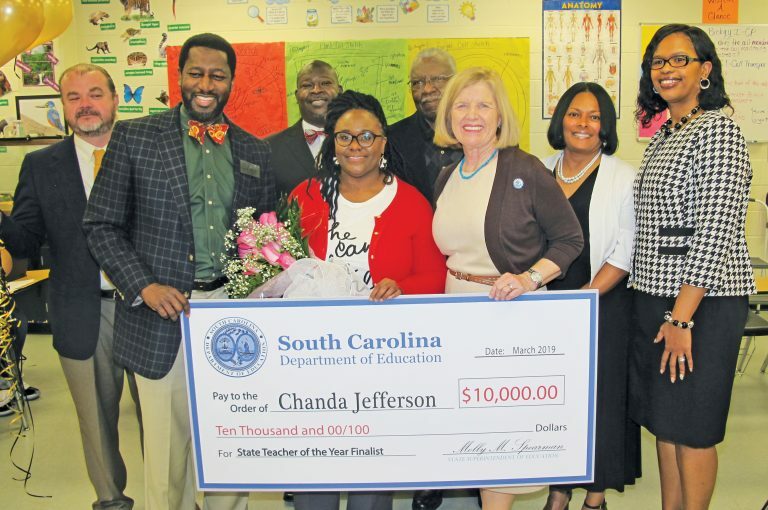 Jefferson will next compete for South Carolina Teacher of the Year at the annual Gala, to be held on May 8 in Columbia where the overall winner will be crowned.